New Agenda 21 DVD Complete! 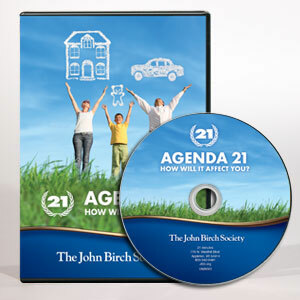 The John Birch Society has now released a new DVD, “Agenda 21: How Will it Affect You?” This DVD will explore the agenda environmentalists have in store for you and your family. This 20 minute DVD has received nothing but great reviews and offers a great introduction to Agenda 21 using the words and actions of those who are promoting this agenda. This DVD is an excellent tool to use to educate new audiences and to generate interest in the “Choose Freedom, Stop Agenda 21” action project. “Agenda 21: How Will It Affect You?” is available for viewers on YouTube and is available for purchase in the JBS store! Two JBS videographers, Nathan Sheppard and Jason Vincent, were sent to Plymouth and Boston, Massachusetts to film the Christian Heritage Academy seniors from Oklahoma City, Oklahoma on their tour of Boston and Plymouth and a number of the historical sites in the area. Nathan and Jason spent eight days filming the students and their journey around Boston and Plymouth. They toured monuments, museums, boats, the Boston Pops, breaching whales and were even able to take in a game at the historic Fenway Park. Although they were able to see many amazing sites, Nathan says the most amazing part was working with the students. They took time to offer to help carry equipment, open doors and elevators and most importantly were extremely cooperative. The trip was an overall success! They got over 15 hours of footage of true American history, learned a lot about our country’s history and saw a ton of fantastic sites.